The High-Throughput Screening (HTS) Shared Resource (a developing CCSG shared resource) provides reagents, infrastructure and expertise for screening of chemical, CRISPR, RNAi, and open reading frame (ORF) libraries. The screening platforms supported by the facility enable systematic, comprehensive interrogation of gene function or molecular processes that provide opportunities for discovery of new targets, lead compounds or biological insights. In addition, the shared resource provides assistance with custom functional genomics applications for low-throughput experiments. The shared resource provides services in three major areas: compound screening, functional genetic screening and custom genetic perturbation services. Instrumentation is available for most quantitative assays in the form of multimodal plate readers and a Cellomics ArrayScan High-Content Screening (HCS) system. 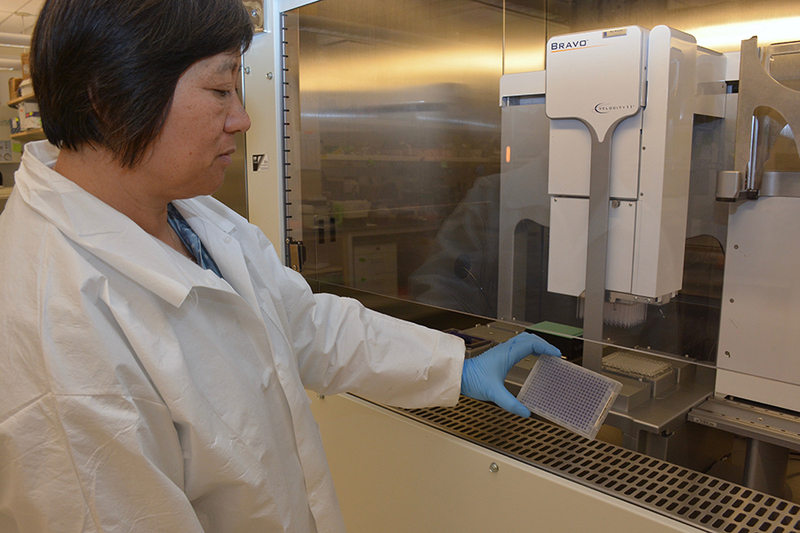 The shared resource assists investigators perform high-throughput compound screens in 96- or 384-well format using screener-provided or in-house libraries. In-house libraries range in size from 120 to 50,000 compounds. For more information, please visit https://sites.duke.edu/functionalgenomics/libraries/compound-libraries/. Screening platforms include lentiviral human kinome ORFs (arrayed or pooled), lentiviral human ORFs (pooled) or Synergistic Activation Mediator (SAM) lentiviral human CRISPR sgRNAs (pooled). The shared resource can work with investigators to create knockdown, knockout, knock-in or overexpression cell lines using shRNA-, CRISPR- or ORF-based approaches. Individual lentiviral shRNAs from the Sigma Mission human collection are also available for distribution. Labcyte Echo Acoustic Dispenser for fast and flexible transfers of nanoliter volumes, ideal for compound screening and generating dose-response experiments. Bravo Automated Liquid Handler for high-throughput transfers of microliter volumers for 96- or 384-well plates integrated with barcode labeler, heat sealer and BenchCel Robot for microplate management. The entire system is housed in a Baker BIOPROtect II cabinet. Cellomics ArrayScan High Content Screening (HCS) system for automated acquisition and analysis of plate-based images, integrated with robotic plate stackers and barcode reader for high-throughput plate processing. BMG Clariostar multimodal plate reader with detectors for fluorescence intensity, luminescence, absorbance, FP, TRF, FRET and TR-FRET. This reader is also equipped with dual injectors, temperature control to 45oC, barcode readers and stackers for high-throughput plate processing. Biotek Synergy multimodal plate reader with detectors for fluorescence intensity, luminescence, absorbance, TRF, FRET and TR-FRET. This reader is equipped with barcode readers ahd stackers for high-throughput plate processing. Biotek ELx405 microplate washer, Biotek uFill dispenser, Matrix Wellmate microplate dispenser and VP aspirating wands and manifolds for fast and accurate high-throughput plate processing. Tissue Culture facility, fully equipped with two 6’ biosafety cabinets, four CO2 incubators, inverted fluorescence microscope, Sorvall Legend centrifuge, water bath, freezers and refrigerators, dedicated for use by screeners. Services and resources provided by the shared resource are available to all DCI members. Members interested in utilizing this resource should visit the website or contact So Young Kim, PhD. As a developing resource, the High-Throughput Screening Shared Resource does not currently maintain a fee schedule for DCI members, but offers priority access to these services to DCI members. For information on fees, please contact So Young Kim, PhD.